How Much is a Piano? This all depends on the type of piano you are looking for. An upright? Used? Digital? Hybrid? Grand? Slab?….more important is finding the right piano for your needs first. 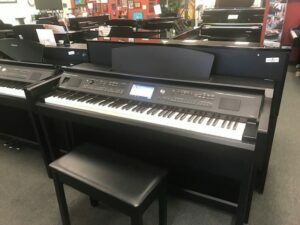 What Do I Look For In a Used Piano? There are two important things to look for. 1) Sound and touch. Does it inspire you? 2) Will the company you are buying from and will the manufacturer stand behind your piano? 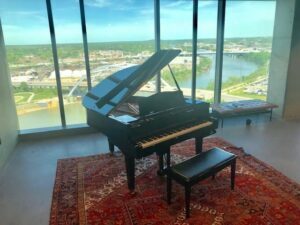 What Kind of Service Does a Piano Need? How Often Should I Tune It? You should tune a piano 2 times a year, when heat goes to air and air goes to heat in your home. This is when the weather tends to effect the piano and the 60,000 moving wooden parts adjusting to the changes the most. With the pressure pulling on the plate, tuning is very important for your upkeep to your investment. What is a Baby Grand? Baby is a term that was used a lot a few years ago. Anything over 5’ is a grand, but there are differences when you go up in size of your grand. 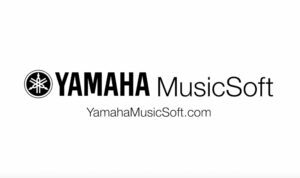 A hybrid piano made by Yamaha is born a hybrid. This means it is a full functioning acoustic, but at the time of birth it has a digital format built into it so you can have the benefits of both worlds by recording, using headphones, using output samples of a larger concert grand and other on board sounds. It is also midi compatible. There are stringed and stringless hybrids with moving parts. What is the Difference in Digital (electric) and Acoustic Pianos? Electric pianos was a term in the 70-80’s. Sampling, nor the technology was not at the quality it is now. An acoustic piano works with moving wooden parts and strings. A digital piano is sampled or modeled from a 9’ concert grand. The acoustic needs tuning, the digital does not, it is always in tune. The digital comes in several styles and options, once again, depending on your needs for the piano or if children are involved. My Child is Taking Lessons, and I’m Not Sure They Will Continue, is a Keyboard Sufficient? Do I Need Weighted Keys? Children should have a weighted 88 note piano, weather it is a slab unit with sufficient stand and bench or a digital piano. They need to start with something that will encourage them, and keep them at the piano, instead of finding other things to do. Always tell your child to “play”, not practice. How Much is My Antique Piano Worth? “Antique” and “Piano” do not really go in the same sentence. There are pianos, and there are antiques. A pianos life is around 50 years, at this point, you will put more into fixing it up than buying a new one. Should I Buy Off of Craigslist, eBay, etc.? Once again, who are you buying the piano from? Is there a warranty? Can they move it with professional movers? Has it been tuned on schedule? People don’t always know how to care for their piano, so they are not trying to “take advantage”, they just don’t know. Using a company that are Specialists’ is your best bet.